Asheville is a city that is near and dear to my heart. I often will pick up novels for that setting alone, but I also have a fondness for Lee Smith novels. While attending college in western North Carolina, I took an Appalachian and Southern literature class, that I absolutely loved. That course introduced me to some of my favorite southern writers such as Charles Frazier and Robert Morgan. It was also my first experience with Lee Smith. I can still remember being glued to my battered copy of Fair and Tender Ladies while friends were going to the movies. I just needed to finish the story and continue spending time with Smith's words. 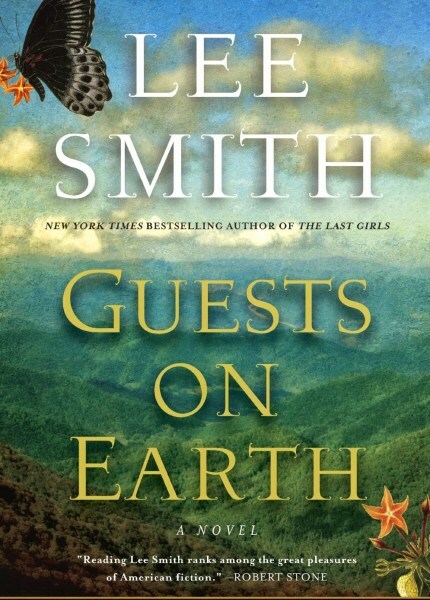 I've read other Smith novels, but this is the first one I have picked up since the blog was born. Asheville aside, I would have read this one anyway for its connection to the tragic Zelda Fitzgerald. The story is told from the perspective of Evalina Touissant, a young girl who grows up in New Orleans. Evalina sees the jazz soaked city from an apartment in the quarter where she lives with her mother. While Evalina is a stellar student and attends church regularly, her mother shields her from the truth of their life. Evalina realizes that everything is not as she assumed when she and her mother move into a quaint house purchased for them by a wealthy New Orleans man. When Evalina's baby brother arrives, things take a turn. The little one is sickly and Evalina's mother sinks into a depression that she will never recover from. Events spiral out of Evalina's control and land her in a mental institution in Asheville, North Carolina. The trauma of Evalina's early years plagues her as she settles into her new home at Highland Hospital. As the weeks pass, she begins to make friends with the other youthful residents and even some of the adult patients. In an art class, she makes the acquaintance of the beautiful and eccentric Zelda Fitzgerald. The pair form an unlikely friendship in the midst of their health struggles that will last into Evalina's adulthood. The story revolves around Evalina's life at the hospital and her eventual departure for college in Maryland. Evalina is a gifted pianist which sends her down paths connected to the world of entertainment. She finds that life beyond the hospital grounds is not everything she had hoped for and a tragedy will send her back to the mountains of North Carolina once more. I have long heard of the famous Highland Hospital and the fire that took the lives of nine female patients in 1948, including Zelda Fitzgerald. As I read this novel I tried to imagine walking to same path as Evalina which lead me to visit the site of Highland Hospital on my last visit to Asheville. It brought a chill to my spine to think of the loss that occurred on the grounds and to see the landscape that the fictional Evalina and the very real Zelda Fitzgerald would have viewed. The marriage of fiction and reality can be a surreal experience. If you've enjoyed the Amazon series about Zelda's life or just enjoy a well written story with a smattering of history and an Appalachian setting, I'd highly recommend picking up this novel. One Last Gripe: I enjoyed Evalina's childhood segments more than her adult ones. I disagreed with so many of her later choices. First Sentence: For years I have intended to write my own impressions of Mrs. Zelda Fitzgerald, from the time I first encountered her when I was but a child myself at Highland Hospital in Asheville, North Carolina, in 1937, and then a decade later during the several months leading up to the mysterious tragedy of 1948. It’s 1936 when orphaned thirteen-year-old Evalina Toussaint is admitted to Highland Hospital, a mental institution in Asheville, North Carolina, known for its innovative treatments for nervous disorders and addictions. Taken under the wing of the hospital’s most notable patient, Zelda Fitzgerald, Evalina witnesses cascading events that lead up to the tragic fire of 1948 that killed nine women in a locked ward, Zelda among them. Author Lee Smith has created, through a seamless blending of fiction and fact, a mesmerizing novel about a world apart--in which art and madness are luminously intertwined. Well, you had to go and mention Asheville..... Just downloaded this book. I love that area! Mesmerized is right, locked in also with the twists in this fictional novel; attended a year of high school near Asheville.